If you are like me, then you know there is no comfort food like homemade mac and cheese! It is super delicious and super easy to make. My mom made homemade mac and cheese all the time growing up and honestly, once you try it, it is so hard to go back to the box stuff! Meanwhile, in a large saucepan, melt butter. Stir in flour until smooth. Gradually add milk and stir until all lumps have dissolved. Bring to a boil; cook and stir for 2 minutes. Reduce heat; stir in the sour cream, processed cheese, cream cheese, Parmesan cheese, salt, and pepper until cheeses have melted. Gradually add cheddar cheese, and stir until cheese has melted and sauce is smooth. Drain macaroni and add to sauce and mix well. Transfer to a greased 3-quart baking dish. Bake, uncovered, at 350 degrees for 30-35 minutes or until bubbly. Remove from oven and sprinkle breadcrumbs over top. Return to oven for another 10 minutes until browned. I was just thinking about mac and cheese this afternoon! And then here it is on your blog and it sounds extra good. Keep posting - you're great! I don't think I will ever eat KRAFT once I try this baby! YUM! I think I'll cook this ASAP!!! I love this blog! You are such a great cook; Derek is a lucky man! This turned out so good! I love all the different cheeses. Thanks for the great recipe! This looks so delicious! I can't wait to make it. I know its going to taste better than box mac and cheese! This looks SO good. I bet it would be a great thing to make ahead and freeze too! How many servings do you usually get out of a batch this size? Oh, my! Made this tonight with my 12-year old son. He's a mac-n-cheese "snob" because I've spoiled him with homemade for years. His favorite part is the bread crumb topping. We've been looking for a go-to recipe and THIS IS IT! I got the roux going for him and he made the sauce on his own! Thanks for a great meal and and an even better time spent with my boy! Just made this using a Triple Cheddar cheese mix and had to have some before I even popped it in the oven to bake! I'm sure it'll be even more delicious once completely finished. Thanks for posting! Made this for dinner last night, my hubby had thirds. :) Any tips on reheating leftovers? Yummy with double the noodles (1 pound total) and a pound of sausage and an onion (sauted together); bake in a 15x11 pan. Made the day before and cooked for 45 minutes. I also doubled the Velveeta and cut the cheddar in half because that's what I had in the fridge. So basically what you are saying is you didn't make the above recipe. Can I sub fresh parm with just the powdery parm stuff? I do. I use shredded parm and it melts beautifully. Would this be ok to make tonight and then bake tomorrow?! How many servings dos this recipe yield? I'm making it for kids. I'm having a sleepover party tomorrow and thought this would be a great thing to feed them. And thanks for sharing it, it sounds delicious. 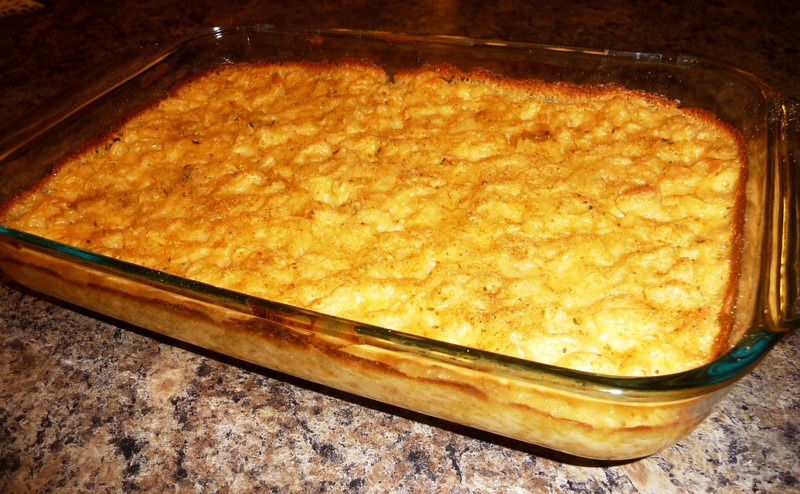 This has got to be the best mac n cheese recipe out there! Everyone should make this... but I think i'm going to keep it secret when they ask me for the recipe! LoL Woooohooo, i'm in heaven!! Hello, just curious how many servings this yields? is the roux suppose to be so thick? I used the 1/2 cup of flour, 1/2 cup butter, and 1-3/4 cup milk? It's so thick like paste. Mine is thick like paste too. It's in the oven now, but I'm scared that it won't come out right. How was yours when done? I am going to make this for Thanksgiving, I hope it turns out great ? I just hope it's not dry. I made some baked mac n cheese before and it was good, but it was to dry ? Can you make this without velveeta?